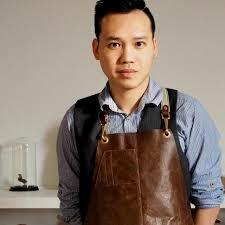 Trying new things can be an exciting, daunting and ultimately rewarding experience. 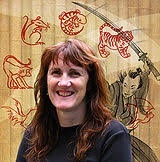 Just ask Sandy Fussell, author of the acclaimed Samurai Kids series. She is venturing into the fastidious and fascinating world of picture book writing and I have to say, has come up trumps. 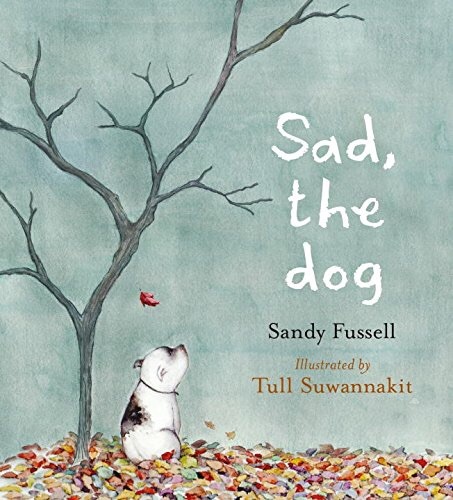 Togethe r with illustrator, Tull Suwannakit, Fussell has brought to life one of the most endearing little dog tales I’ve read in a while. 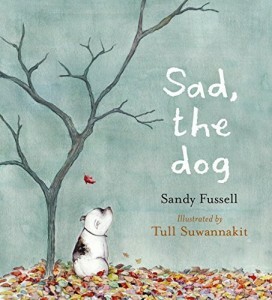 Sad, the dog is a title immediately provoking thought and possibly interpretation as nothing more than a smaltzy, over-sentimental excuse for a cry. It does in fact start a little unhappily at least for poor pooch, Sad so named because his well-meaning but blatantly non-dog-people owners, Mr and Mrs Cripps neglect to give him an identity of his own. 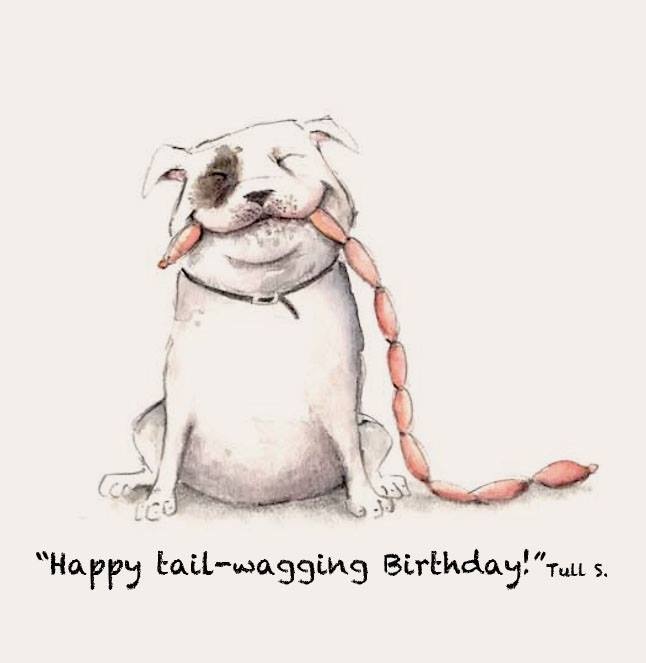 Sad receives the basics from them but in spite of his doggedness to impress them with his dogginess, he is largely ignored and tragically unloved. Then they up and go, and leave, without him! Misery and loneliness pile up around Sad like mounds of autumn leaves until a little boy named, Jack enters his life. Jack is patient and kind and is exactly the sort of little boy Sad needs. Ever so slowly, Sad learns to like his new situation and especially Jack, so much so that he re-discovers his inner dog and a new whisper in his heart that helps him banish his sad moniker forever. 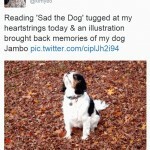 Sad, the dog is a picture book that invites repeated readings because each time you do, you will fall in deeper in love with the indomitable black and white canine and comically drawn characters. Sad represents the unquestionable loyalty and willingness to please that dogs possess and suggests that they experience the same sense of rejection and loss as keenly as humans do. When Sad’s beliefs are shattered and abandoned, it takes him a while to forget his fears and learn to be brave enough to try that ‘something new’ again. However, with the help of a new friend, he does. Sometimes, that’s all it takes; a special someone to tease the real you back out into the open again. 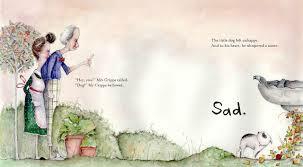 I love this intimation and heart-warming message that permeates throughout this picture book, and is captured so beautifully by Suwannakit’s glorious watercolour illustrations. Muted tones, appealing detail and ridiculously funny characterisation (I was reminded of Gru from Despicable Me at times) provide plenty of balance and personality, and exude love in an otherwise sad tale about an unwanted dog. Sad eventually finds love after hiding beneath his pile of unhappiness. It is red and wonderful (and incidentally the colour of Jack’s hair and the falling leaves) and is anything but sad. 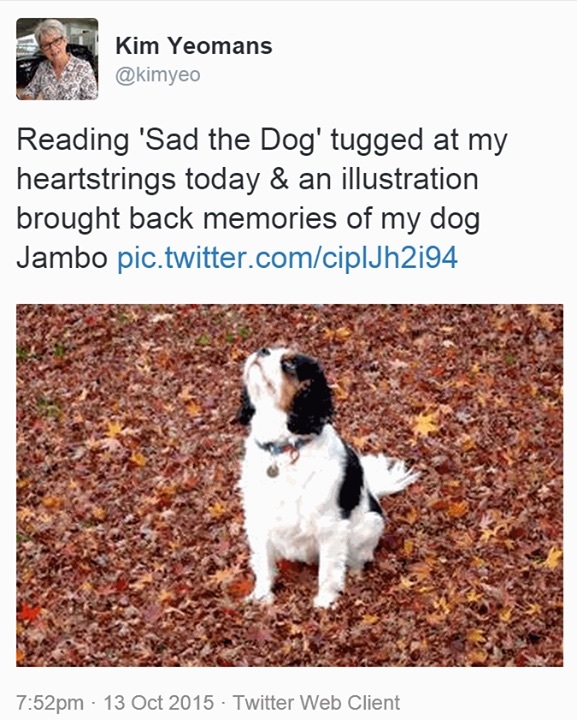 You and young readers from the age of three onwards will feel it too whether dog lovers or not. Highly recommended. Fellow blogger, Romi Sharp is interviewing Sandy Fussell, soon. 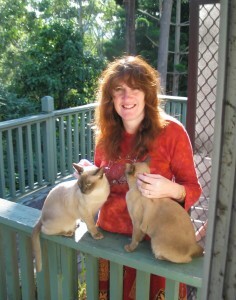 Be sure not to miss her revelations and insight into Sad’s creation.